Most Cambodians consider themselves to be Khmers, descendants of the Angkor Empire that extended over much of Southeast Asia and reached its zenith between the 10th and 13th centuries. Attacks by the Thai and Cham (from present-day Vietnam) weakened the empire, ushering in a long period of decline. The king placed the country under French protection in 1863 and it became part of French Indochina in 1887. Following Japanese occupation in World War II, Cambodia gained full independence from France in 1953. In April 1975, after a five-year struggle, Communist Khmer Rouge forces captured Phnom Penh and evacuated all cities and towns. At least 1.5 million Cambodians died from execution, forced hardships, or starvation during the Khmer Rouge regime under POL POT. A December 1978 Vietnamese invasion drove the Khmer Rouge into the countryside, began a 10-year Vietnamese occupation, and touched off almost 13 years of civil war. The 1991 Paris Peace Accords mandated democratic elections and a ceasefire, which was not fully respected by the Khmer Rouge. UN-sponsored elections in 1993 helped restore some semblance of normalcy under a coalition government. Factional fighting in 1997 ended the first coalition government, but a second round of national elections in 1998 led to the formation of another coalition government and renewed political stability. The remaining elements of the Khmer Rouge surrendered in early 1999. Some of the remaining Khmer Rouge leaders are awaiting trial by a UN-sponsored tribunal for crimes against humanity. Elections in July 2003 were relatively peaceful, but it took one year of negotiations between contending political parties before a coalition government was formed. In October 2004, King SIHANOUK abdicated the throne due to illness and his son, Prince Norodom SIHAMONI, was selected to succeed him. Local elections were held in Cambodia in April 2007, and there was little in the way of pre-election violence that preceded prior elections. National elections are scheduled for July 2008. From 2001 to 2004, the economy grew at an average rate of 6.4%, driven largely by an expansion in the garment sector and tourism. The US and Cambodia signed a Bilateral Textile Agreement, which gave Cambodia a guaranteed quota of US textile imports and established a bonus for improving working conditions and enforcing Cambodian labor laws and international labor standards in the industry. With the January 2005 expiration of a WTO Agreement on Textiles and Clothing, Cambodia-based textile producers were forced to compete directly with lower-priced producing countries such as China and India. Better-than-expected garment sector performance led to more than 9% growth in 2007. Its vibrant garment industry employs more than 350,000 people and contributes more than 70% of Cambodia's exports. The Cambodian government has committed itself to a policy supporting high labor standards in an attempt to maintain buyer interest. In 2005, exploitable oil and natural gas deposits were found beneath Cambodia's territorial waters, representing a new revenue stream for the government if commercial extraction begins. Mining also is attracting significant investor interest, particularly in the northeastern parts of the country, and the government has said opportunities exist for mining bauxite, gold, iron and gems. 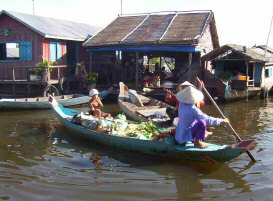 In 2006, a US-Cambodia bilateral Trade and Investment Framework Agreement (TIFA) was signed and the first round of discussions took place in early 2007. The tourism industry continues to grow rapidly, with foreign arrivals reaching 2 million in 2007. In 2007 the government signed a joint venture agreement with two companies to form a new national airline. The long-term development of the economy remains a daunting challenge. The Cambodian government is working with bilateral and multilateral donors, including the World Bank and IMF, to address the country's many pressing needs. The major economic challenge for Cambodia over the next decade will be fashioning an economic environment in which the private sector can create enough jobs to handle Cambodia's demographic imbalance. More than 50% of the population is less than 21 years old. The population lacks education and productive skills, particularly in the poverty-ridden countryside, which suffers from an almost total lack of basic infrastructure.